Whose fire is it anyway? Last Saturday I went to the church at the top of my street, to help out with some cemetery clearance work. I am not a churchgoer, but as a local I wanted to do my bit. Plus I have a side interest in gathering firewood, and as it happened the previous weekend’s storm had taken down some large branches that I had my eye on. The graveyard is in a forest setting. Over the years, it has become over-run with ivy, self-seeding trees, brambles and other invasive plants. The new vicar, Fr Paul Trathen, wants to make the space more inviting, to build the church’s connections with the community, and to allow some of the Victorian commemorative stonework to be better appreciated, without damaging the site’s conservation value. So a volunteer team was pulled together, a clearance day organised, a bonfire started, and by around 1 pm it was burning and smoking nicely. Not long after, a fire engine pulled up – blue lights and siren blazing – and the firemen told us that the fire had to be put out. Fireman: You need to put this fire out. Vicar: Why do we need to put it out? Fireman: We have had a call from a member of the public who had seen the smoke. Vicar: The fire is not dangerous. It is under constant adult supervision. We have a full water bucket ready, and a mains water supply in this toilet block [about 3-4 metres away from the fire]. The fire is on a hard standing, and it is in a clearing. Fireman: You still need to put the fire out. 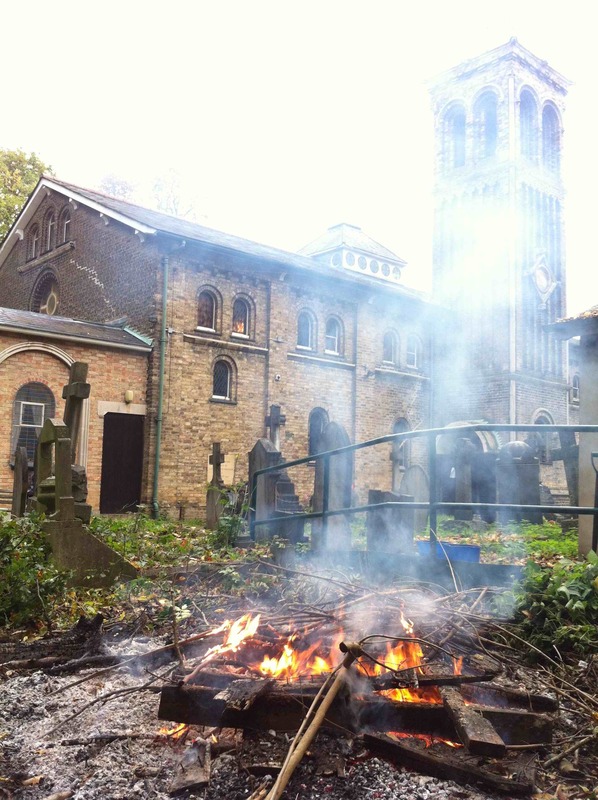 Vicar: I have been trying for the last six weeks or more to get in touch with the London Fire Brigade to notify you of our plans to have a bonfire, to avoid this very situation. No-one answered my emails. There is no information or number to call on your website. We knew we would have large amounts of greenery to get rid of because of our clearance work. What are we supposed to do with it? Fireman: You can drag it through to the forest floor and leave it there. Vicar: How is anyone supposed to be able to organise a fire? What about bonfire night celebrations? Fireman: We only allow organised fires. Vicar: This is an organised fire. How are we supposed to organise a fire in future? Fireman: London is a no fire zone. You cannot have a fire. So the fire was extinguished, and the work had to stop. Now, in the London Fire Brigade’s defence, bonfires can be a hazard, a danger, and a headache. What is more, during this summer’s heatwave, there were a few major (for London) grass fires in Epping Forest, just a few hundred yards from the church. But it still seems to me that the firemen’s response was disproportionate, to say the least. So far as I can see, we were following to the letter the London fire brigade’s own guidance on bonfires (which is pretty reasonable). 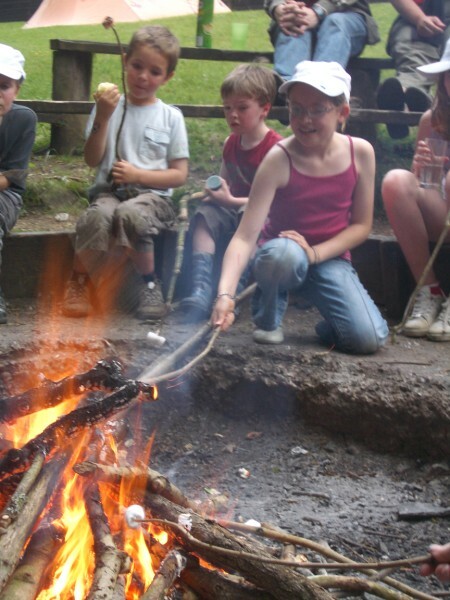 Fire activities have been an established part of outdoor learning since Baden Powell’s days, and this remains the case today – for instance in Forest School programmes. I know of a few adventure playgrounds in London – and even some nurseries – that have regular fires. Without exception, those involved speak powerfully about the value of fires: about how they help children to appreciate the power of the flame, and how they encourage children to take responsibility for their safety. They tell of children’s fascination with the process – which points to a deep connection with the most elemental of human need for warmth and food – and of the intense satisfaction children gain from mastering skills like using a fire steel. And they describe the unique ambience that only a group seated around a bonfire can create, and the special exchanges, experiences and conversations that arise as a result. Yet I know that educators and playworkers who are thinking about introducing fire activities can face resistance – from managers, from insurers, from health and safety officials, and also, it appears from the fire service. My fear is that for whatever reason, some fire services are not willing to use their discretion or judgement – or to allow their officers to do this. Instead of taking a balanced approach – one that recognises the value and use of controlled fires – they are nervous about the very idea. When there is a call out, there is heavy pressure for any fire to be extinguished on the spot, no matter how well-managed. As the statutory service that takes the lead on fire safety, the fire service’s views are rightly taken seriously. But are they taking the right approach? What is your experience – and do you have any advice about how to respond to their concerns? As ever, I would welcome your thoughts and comments. 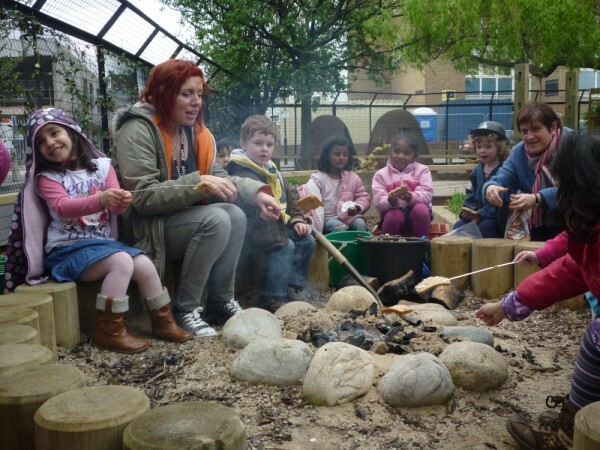 This entry was posted in Learning, Outdoor play, Risk and tagged Adventure playground, fire, Forest school, London, outdoor education, outdoor learning, Risk, Walthamstow. Bookmark the permalink. Nanny state again and health and safety gone mad yet again. We are not allowed to have fires on our allotments but all the gardens bordering the site have them. We get their smoke! Crazy. You can sympathise with the fire services. They deal with the consequences of fires which have got out of control. Saying that, l wonder what their records and statistics show in terms of how fires are started and in the circumstances which led to the need for the fire brigade to be called to attend. In Aberdeen City, several years ago, there were a series of fires that were started by children and young people. Part of the problem was that the C&YP didn’t know how to light and manage a fire safely. The City Ranger Service, in coordination with the fire service worked together with local children and young people to learn about and understand fire through practical sessions. The result was a drop in fire raising incidents. Thanks for the comments. Greenbenchramblings – it certainly looks like a risk averse overreaction. However, when I hear a diagnosis of ‘health and safety gone mad’ I tend to think that’s just the start of the story. If the trend is to be turned around we need to understand more about why these bureaucracies act in this way. Then we can start to challenge and change. Juliet – that’s an interesting case study – thanks for sharing it here. I had such an altercation that resulted in me having a rather heated meeting with the ‘fire education officer’ for the area who told me that fire of any nature is bad and children should not experience it. I threw every argument I could think of at him including: candles on a birthday cake, the scouts, learning to light a solid fuel fire in the home, fire as a tool essential in our evolution…. NOTHING! It was a brick wall and as far as he was concerned there was no reason for fire to ever be used…. FIRE BAD! I questioned him on his own use of fire as a child, he proudly told me he had never used it and never once toasted a marshmallow…. Perhaps that tells the real story! Subsequently we were told not to use fire… obviously however, being told and doing are two very different things! Recently I spoke with a family friend and retired Fire Officer about my altercation and the subject of children using fire and the benefits of it. He fully sympathised with what you talk about Tim and said that, he as an individual, has never had any objection to children using fire and that as a child himself he enjoyed many a small fire without the presence of an adult around. He suggested that many of the ‘fire men’ from his generation felt very much the same, but that we would find it impossible to find a current fire officer who would ever come forward and challenge the zero tolerance stance as in short, it would be career suicide. One of the issues from the Play Professional point of view is that I feel we should consider carefully in such cases our use of the word ‘Play’. For many people the word ‘play’ when used in alignment with ‘fire’ represents many negative connotations of irresponsible behaviour and terrible 1980’s public hsafety videos…. Charlie say’s don’t play with matches etc. So in such cases it may be possible that the word ‘play’ has been demonised to the detriment of the experience. Hi Tim. 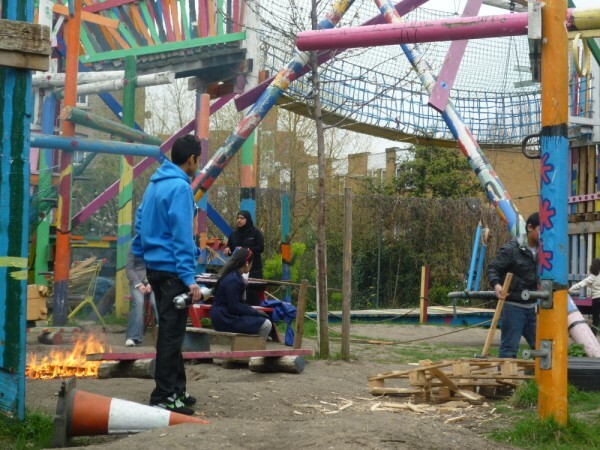 I’m glad to say that most adventure playgrounds in this area of east London regularly have camp fires, especially this time of year. There is some ‘playing’ with the fire – poking sticks in, seeing what different materials burn like, some cooking – from marshmallows to soup and jacket potatoes, and plenty of wistful gazing, reminiscing and story telling. So far, I haven’t heard of any trouble with local fire brigades, although one parent did complain once that London was ‘supposed to be a smoke-less zone’. I think that may be a throw back to the old days of smog. I wonder if anyone knows if the smoke-less zone still applies. Chris, Nick – thanks for the comments (and for the reference Chris). Interesting to read your more detailed account of the exchanges with the fire service on the Island Chris – revealing and depressing. I hope that the more positive precedents that others have shared here (including Juliet and Nick) will be of use in making the case for a more balanced approach. On a more serious note I’d be interested to know under what authority the Fire Brigade officer acted when insisting on extinguishing this small and clearly harmless bonfire. Does the Fire Brigade have the authority to enter private premises and spray water about without a court order, when the site owner refuses permission and there is clearly no public safety concern? If that is true, then they could also for example break into a private house and extinguish a child’s birthday cake candles, if some particularly pedantic and foolish officer decided he did not like seeing the little flames through the window. Is this true? Do they have this power? If so it’s a scandal which need investigating further. The law is the law, you can’t have it both ways. Does anyone know? If that was my harmless bonfire and I told the fire officer to ‘go away’, and/or resisted his men’s entry onto my private land, would I be committing an offence? Maybe there are anti-pollution/’smokeless zone’ regulations in force, but that would be a matter for the Police or Local Authority, not the Fire Brigade. Is someone’s authority being exceeded here? Possibly by a man who sounds like a pompous twit. Hi Tim and all. Another nice one, Tim and a subject I so completely agree with. It is no coincidence that children sitting round a fire is on the front cover of both the original and revised versions of Managing Risk in Play Provision. Such a long standing battle to have the importance of fire recognised along with the other elements of water, earth and air. So fundamental to play and still not common in public settings. So keep up the good work! Felicity – possibly changed advice, but more likely an inconsistent and confused position I’d say. Good to hear of your more positive experience. Eeeeeeek… I do so love a ‘H&S Gone Mad’ story. I did a 50 Dangerous Things party for 12 six year olds on Sunday in Won’t Mention The Name Woods and we cooked on our fire: fully risk benefit assessed beforehand; all adult helpers briefed; built in a clearing in which we had removed all nearby leaf litter; built in my fab helicopter drip tray, which itself was placed on bricks; kept under adult supervision for 2 hours with fire blanket, fire extinguisher and water pail immediately adjacent; put out fully afterwards… lucky the Fire Service didn’t catch wind of it. Fire is a key ingredient in my teaching programmes, whether they are for children or adults. We don’t always make a fire, but we almost always talk about it and human beings of all ages are fascinated by it. The attitude you’ve highlighed above, Tim, is in my opinion utterly counterproductive. Thanks for this Julie – sounds like a great session. Er, what’s a helicopter drip tray? Hi Kenneth – thanks for dropping by and leaving such generous feedback. Do keep me posted on progress.